he Animated Series and The New Batman Adventures. It revisits several episodes, expanding some scenes, adding others, and skipping some. The story picks up from the middle of issue #2, when Tim Drake spies Batman, Robin, and Batgirl fighting Joker, though now we see the fight from Tim’s point of view. Tim sees Joker create an explosion, and some of the debris makes it as far as Tim’s perch from a nearby building. In the wreckage, he finds a Batarang. Later, we seem Tim practicing with the Batarang, when his father tells Tim he needs to “get this Bat garbage out of your system.” He explains that Two-Face is a friend. But Tim doesn’t give up on his idol. Soon, he is breaking up fights between kids. But Tim’s dad doesn’t give up either. As he leaves for another Two-Face job, he explains that he’ll always be a crook, and so will Tim. That night, Tim’s dad write Tim a note explaining he has to leave town while the heat is on. Tim is now on his own, and is forced to steal to get by. At this point, the story catches up to the episode “Sins of the Father.” Tim has stolen a policeman’s donuts, and climbs the fire escape to his apartment to get away from the cop. Once inside, he runs into Two-Face and his goons. They want Tim’s dad. They take Tim to the docks. 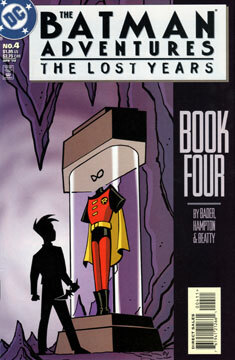 Before Two-face can kill Tim, Batman appears, and disrupts the execution. Batman is wounded, and in turn Tim saves Batman. Together, they escape in the Batboat. Before falling unconscious, Batman engages the Batboat’s autopilot, and he and Tim and are taken to the Batcave. Alfred is surprised to find a “guest” accompanying Batman. While Alfred sees to Batman’s wounds, Tim sneaks upstairs, and discovers Batman’s secret identity. Fortunately, Batgirl arrives before he can learn more. Before the Bat clan can decide what to do with Tim, Two-face threatens the city with a gas attack unless his ransom is paid. Batman and Batgirl leave to intercept, leaving Tim behind. But Tim is not one to be left out. He steals the Robin suit and follows them. At Two-Face’s hideout, a fight erupts. A well-placed throw of Tim’s Batarang saves the day. The story gives us one last bonus scene not in the episode. Back at the Batcave, Batman tells Tim he is not allowed to where the Robin suit again, until Tim earns the right. Batman promises to train Tim. And even though Batman demanded the Batarang back, Tim kept it, as it’s his security blanket at night. I enjoyed the heck out of this issue, as it ties together “Old Wounds” and “Sins of the Father” nicely. I almost wish this whole series had been longer, so more time could be devoted to filling in the narrative gaps. Still a little on the generic side, but stronger then the previous two issues. On a design note, the issue is firmly in “TNBA” territory, never to look back. Not beyond the standard Bat costumes.